I woke up with a heat rash all over my neck this morning because it was so hot during the night. I didn't sleep in my sleeping bag at all. Luckily when we went outside it was much cooler and the rash died down and stopped itching. We had croissants for breakfast at the campsite and then packed up to head to the perfume factory. They make a lot of perfume in this region of France. They took us on a tour through the factory and explained how they make perfume and soap. To make 1kg of essence, they need to use 3.5 tonne of rose petals. None of the perfumes overly appealed to me so I didn't buy any, but it was an interesting tour anyway. 45 minutes after leaving the factory, we passed through the border into Italy. It was 3 hours until the next stop, and here we had our first Italian language experience. We ordered a piece of pizza each, which was a quarter of a pizza and about the size of 3 NZ pizza slices. The people at this service station weren't impressed with us. We could tell they were mocking us all in Italian to each other. It feels like we finally got used to French and got more confident, and now we have to start all over again with Italian. After another 2 hour drive we were at the Leaning Tower of Pisa. It's in the middle of nowhere out in the country. We had to park the bus and then walk a wee way to get there. I know I've said this in almost every single post, but oh my god it was hot! It was the hottest it's been so far - must've been 30+ degrees. By the end of it, we were all so desperate to get back onto the air conditioned bus. The tower wasn't as tall as I expected, and I didn't realise you could go to the top of it. I thought it was shut off because it was too dangerous, but I don't know where I got that idea because there were people up there. 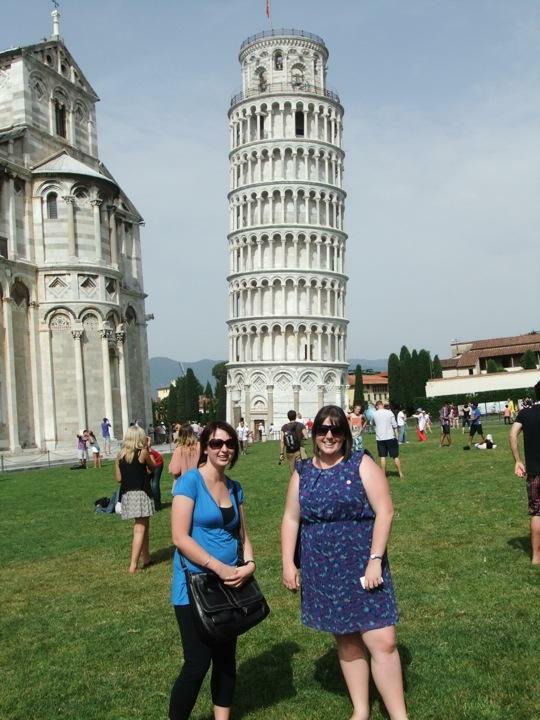 We didn't have time to do that though unfortunately, but we did get the touristy 'pushing the tower' photos. I also got a photo of the next letter of my phrase (R). It was another long drive to the campsite in Florence. We arrived at 7pm and again literally had 5 minutes to get ready for tea. We're in 4 person cabins this time, but we still have 2 bedrooms and then just share a bathroom. These are probably the nicest ones we've stayed in so far. About an hour after dinner, there was a bus going into town to a karaoke bar, but heaps of people didn't go because this is the first place we've been able to do washing. So we sat and waited for the washing machine and then dryer for about an hour and a half. We finally had wifi but realised afterwards that we got ripped off paying for it. But this allowed me to update 4 days worth of blogs anyway. Tomorrow we're heading into the city to see a leather demonstration first and then we're doing a walking tour around Florence. After so much time on the coach, we all have super fat feet and ankles, so walking around the city will be interesting. After that, Stacey and me want to do a hop on hop off bus tour around Florence because neither of us really know what is in Florence, so if we do the hop on hop off, then we can spend a couple of hours just cruising around and having a look at Florence, and then get off if anything appeals to us/if we have time.